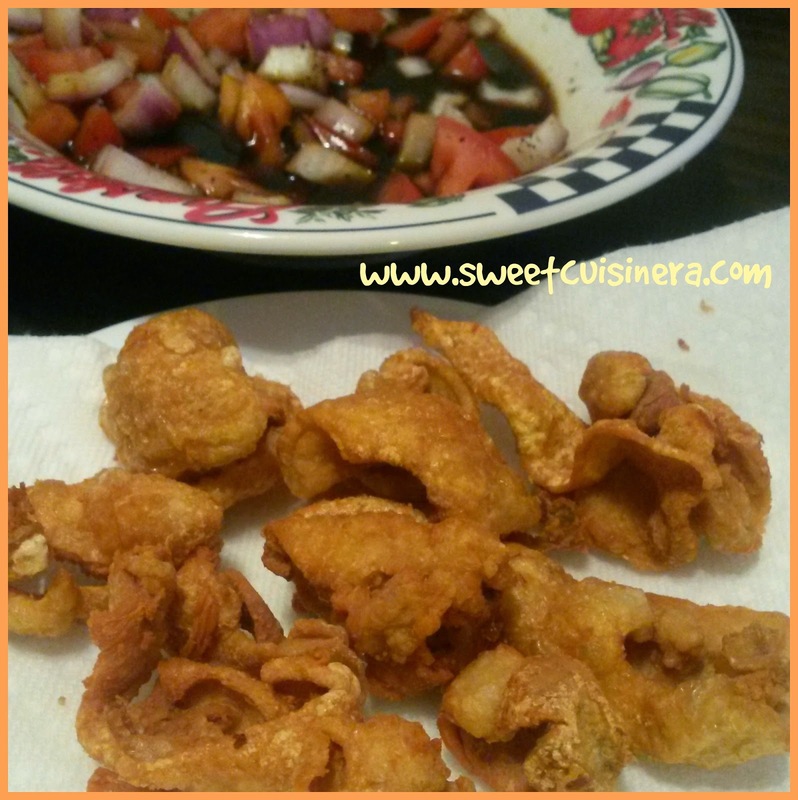 I'm so excited to share with you all my very own HOMEMADE Chicken Chicharon- Wohoo! I felt like I accomplished something so big (hahahha) I just get so excited having Chicken Chicharon in front me and it taste just like what I have back home. 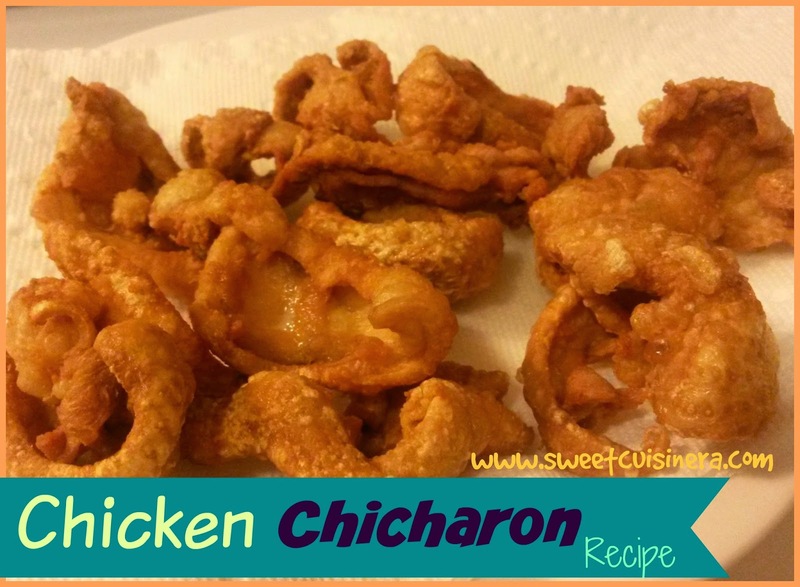 I'm such a big fan of Chicharon wether its pork,chicken or beef- they are all delicious and addicting. Have I told you that making Chicharon is easy as pie? Oh yeah! easy peasy and it only require 3 ingredients. Hello! that is amazingly good right? So, are you excited to make your very own homemade Chicharon? Come on and don't forget to invite your friends and have FUN cooking! Sauce (Optional)- Adjust the taste according to your preference. 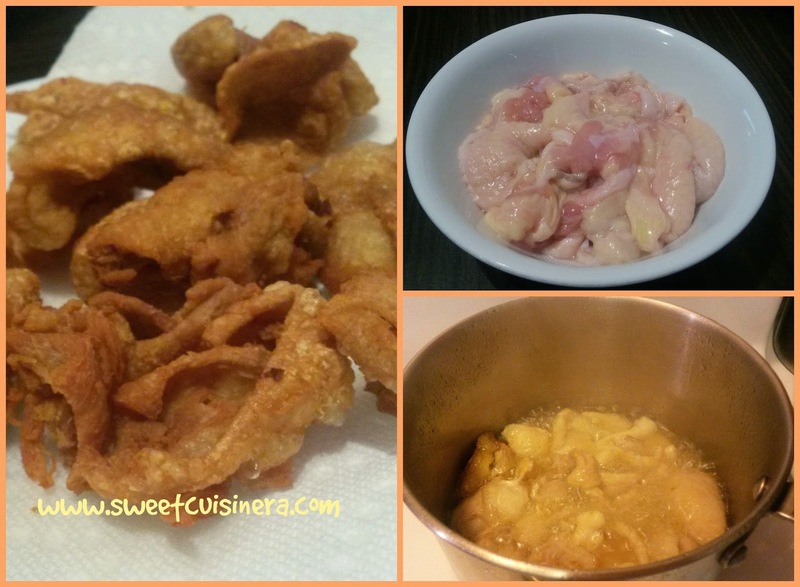 - Combine all the ingredients above and serve it along with your very own homemade Chicharon. 1.) Put little salt and pepper into the chicken skin. Set aside. 2.) Pour decent amount of oil in medium size pan. (If you do have a deep fryer then that would work too:) Let it heat through maybe about 15-20 minutes medium heat. 3.) Once the oil is hot. Slowly add the chicken skin cutlets. Let it fry until its golden brown and crispy. (Be careful of splashing oil) Check the Chicharon every once in awhile and make sure the every part of the skin is covered with oil. 4.) Once the Chicharon is cooked. Lay them out in paper towel to drain excess oil. I promise you! It won't hurt you if you eat Chicharon once in awhile and its DELISH! I can't help myself going back for more..(hahahha) Its addicting, crunchy, and super yummy! Definitely took me back in Pinas. I'm so proud that I finally make my first Chicken Chicharon and I hope you enjoy this recipe as much as I do. I'll see you in few days for more scrumptious recipes and stay gorgeous everyone! I love chicharon too, I always buy chicharon after my grocery because there is a kiosk who sells chicharon outside the supermarket. hehehe! But I haven't tried homemade. I've been looking for chicken skin in supermarket but it is always unavailable. I used to make chicken sisig out of chicken skin aside from making it crispy chicharon. oh wow, this made my mouth water. I love chicken skin. You are right we can have a little bit of everything (in moderation). I also like chicharon but I try to avoid it for health's sake. Eating once in a while, I guess, is okay, except when one has at risk of heart disease. I agree its not healthy but Its so good! Hard to resist. Thanks! Well, I had to try it. I cooked some last week and we all love it. Crispy delicious. It looks wickedly good. Unfortunately I won't be able to taste it as am currently on a diet. Thanks for sharing! I love too cook also, pero I can eat a whole plate of this hahaha! OMG! it is too sinful but I would gladly get a few bites. It is very sinful! but its heavenly good. Few bites won't hurt. :) Thanks! My daughter loves crispy chicken skin! I agree with you, Sis. In moderation tapos may soda! We sometimes eat this too with rice. And though my parents are in their 60s, we frequently have this at home. Di nga lang homemade. My hubby likes chicharon. He could like this, too. I am not very fond of chicharon, hehe, especially chicken skin and bulaklak. Awee! Cholesterol overload haha. But I agree, foods like this are so addictive. Love it! I love chicken skin sis. Yan lagi hinahanap ko sa meat section. Yun lang it's high in cholesterol, so sinful hehe. This is so sinful. You need to eat this in moderation. I get dizzy when I eat too much of it. But this is really delicious. I used to eat this before but I was warned of health issues but it's really delicious. I will try to look for chicken skin this week so I can make sisig out of it. Yung totoo, I love eating chicken skin especially if it is this crunchy! I usually buy this from a store in Mandaluyong before. Very yummy! But I am not sure if it is healthy, though. Its not healthy Sis but eating in moderation won't hurt. This is also one f my favorite. Thanks! Of course chicken chicharon is delicious! But as you said we have to eat in moderation. It's one of my favorite foods. I partner it with spicy vinegar with lots of onions. Yummy! When I was a kid, I would eat a fried chicken's meat first so I can indulge on the crispy skin right after. With what you did, no need to wait. Everything is divine indulgence! Haha!